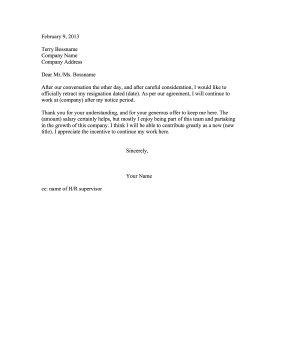 If a company convinces a resigning employee to stay, they can use this printable letter to withdraw the resignation. After our conversation the other day, and after careful consideration, I would like to officially retract my resignation dated (date). As per our agreement, I will continue to work at (company) after my notice period. Thank you for your understanding, and for your generous offer to keep me here. The (amount) salary certainly helps, but mostly I enjoy being part of this team and partaking in the growth of this company. I think I will be able to contribute greatly as a new (new title). I appreciate the incentive to continue my work here.